For Symphonic and Gothic Metal fans I suggest you investigate and make up your own minds. 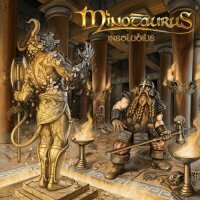 'Insolubilis' is the fifth album from German Ancient Epic Metal outfit Minotaurus, a band who've enjoyed a lengthy career and have a strong core fan base in their homeland where they tour frequently. The music they create is without doubt an acquired taste and sits within an extremely small niche market. It's the sort of music that has a dedicated and unwavering following but is not easily accessible to casual music listeners. They combine Metallic riffs and Traditional Folk quite effectively and generate a quite grandiose, epic ambience to their music. There is heavy use of Folk throughout and a varied number of instruments are used which gives the music an otherworldly atmosphere which is exactly what they are going for. Whilst it's described as Celtic, there's more of a Medieval tone to what they are going for on this album. The occasional female vocals and harmonies boost the ethereal vibe of the music and strengthen the Medieval feel. These vocals contrast well with the deeper Metal tones of the lead singer and blend a lot better than you would think. Lyrically, it's all fantasy-based which obviously suits the tone of the music but songs about wizards and dragons aren't for everyone. The guitar riffs are very German eighties Metal with some NWOBHM influences in the mix and there are some quality melodic guitar licks throughout. You can't knock the class of the musicianship shown, especially on the Folk instruments which I'm sure will make them very popular within their music genre's fan base. It's produced by Rolf Munkes who does a great job and gives them a crystal clear and smooth production. The polish he gives the music provides the band with a great sound. Minotaurus don't create the sort of music that engrosses me, but it's not an unpleasant listen and there are many aspects to 'Insolubilis' that are really cool, albeit it's more frequently cringe-inducing. I suspect the niche market this is aimed at will really enjoy and take to this album of eighties Metal and Medieval Folk fusion and they will no doubt don their Robin Hood feather cap, grab their favourite recorder flute and dance the 'Hey, Nonny Nonny' through the woodlands while playing this album through Ye Olde iPod.